With a belly full of blood, this little vampire takes a rest before flying away. Near record rainfall in April and a soggy May have filled natural vessels like tree holes and low lying swales with standing water and created perfect nurseries for breeding mosquitoes. A five gallon bucket behind my tool shed is home to more than a thousand mosquito larvae and pupae. With temperatures rising and legions of female mosquitoes emerging from the drink, as Paul Thomas Anderson said, “there will be blood”. 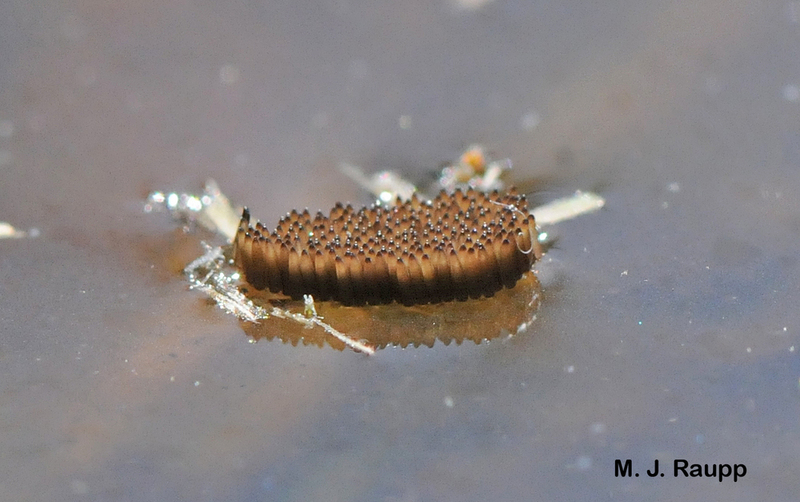 Hundreds of larvae will hatch from mosquito egg rafts floating on the surface of the water. During the first several days of adulthood, both male and female mosquitoes consume carbohydrate rich food such as plant nectar or aphid honeydew. For male mosquitoes, sweets remain the sole source of food, but the gal has a blood lust. Female mosquitoes use animal blood as the source of protein to produce eggs. The pregnant mosquito lays her spawn in a water-filled container such as a pail or a bird bath, or in pools of standing water on the ground. Some, like the ferocious Asian tiger mosquito, Aedes albopictus, lay eggs near the water line of a container. When the vessel fills with rainwater, the eggs hatch and larval development begins. Others, such as the Northern house mosquito, Culex pipiens, lay eggs in clusters called rafts that float on the surface of the water. Each raft can contain more than 150 eggs. Mosquitoes are more than just a nuisance and several species carry important diseases such as West Nile Virus. West Nile virus has killed more than 1,500 people in the United States since it was first detected in New York in 1999. While most of us shrug off West Nile virus if we are exposed, it can be severe and even lethal to seniors and certain others. Recent research helps explain why this may be so. Our immune system plays a vital role in preventing diseases carried by mosquitoes. Cells lining our skin and mucus membranes bear specialized virus-sensing proteins called Toll-Like Receptors a.k.a. TLRs. TLRs have the critical function of detecting invaders like West Nile virus. If TLRs detect the West Nile virus, they release additional proteins that stimulate production of chemical communication compounds called interleukins. Interleukins released into the bloodstream marshal cellular assassins called macrophages and direct them to hunt and kill cells infected with West Nile virus before the virus can multiple and make us seriously ill. Researchers have suggested that some seniors and people with compromised immune systems may lack sufficient TLRs and related immune system proteins to thwart the West Nile virus. Mosquito larvae filter food from the water. Both larvae and pupae hang beneath the surface and gather air through specialized breathing tubes called siphons and horns. Many species of mosquitoes prefer to feed at dusk and you can avoid being bitten by staying indoors in the evening. However, unlike many of our native mosquitoes, the exotic Asian tiger is a daytime biter, adding hours of entertaining itching, scratching, and swatting to days in the garden. Protect yourself from aggressive biters by wearing light-weight, long-sleeved shirts and pants when working outdoors. Certain brands of clothing are pretreated with mosquito repellents such as permethrin. I have worn these in tropical rainforests where mosquitoes were ferocious and they really did help. Many topical insect repellents can be applied to exposed skin before you go outdoors. Some will provide many hours of protection, while others provide virtually none. Some repellents should not be applied to children and you should always help kids apply repellents. Do not apply repellents containing DEET under clothing. For safety, be sure to read and follow the directions on the label of the repellent before you apply it to people or clothing. If you dine outdoors, place a small fan on your patio. The light breeze created by the fan will greatly reduce the number of mosquitoes flying and biting. Many traps are also available to capture and kill mosquitoes. Some rely on a light source to attract blood seekers. However, many types of moths, flies, and beetles are attracted to light. Mosquitoes, unfortunately, do not use light to find their meals and are not readily attracted to light traps. One study demonstrated that less than 1% of the insects attracted to light traps were biting flies such as mosquitoes. This study estimated that light traps kill billions of harmless and beneficial insects each year. Actually, mosquitoes are attracted to odors emanating from the host. As we move about the earth, we release many odors including carbon dioxide and lactic acid that are used by hungry mosquitoes to find us. Some mosquito traps release carbon dioxide and will catch many mosquitoes. Much work remains before we fully understand how well these traps reduce biting rates or control mosquito populations in an area. This bucket contains more than a thousand mosquito larvae that will emerge as adults in about a week bringing hours or torment both day and night. To reduce the chances of mosquitoes breeding around your home, eliminate standing water by cleaning your gutters, dumping your bird bath twice a week, inverting your wheelbarrow and getting rid of water filled containers. If you have an aquatic water garden or standing water on your property where mosquitoes are breeding, you can use a product containing the naturally occurring soil microbe known as Bacillus thuringiensis israelensis, a.k.a. Bti. Bti comes formulated in doughnut-shaped tablets that can be placed in water to kill mosquito larvae. Battalions of biters are about to make their presence known. Get ready to protect yourself - or give blood. Several interesting articles were consulted in writing this episode, including “How the body rubs out West Nile virus” by Nathan Seppa; “Toll-like Receptor 7 Mitigates Lethal West Nile and Encephalitis via Interleukin 23-Dependent Immune Cell Infiltration and Homing” by Terrence Town, Fengwei Bai, Tian Wang, Amber T. Kaplan, Feng Qian, Ruth R. Montgomery, John F. Anderson, Richard A. Flavell, and Erol Fikrig; and “Density and diversity of non-target insects killed by suburban electric insect traps” by Timothy B. Frick and Douglas W. Tallamy.